Miguel de Cervantes died in 1616 a pauper. He is buried in the convent Trinitarians nuns in Madrid, where there is a search now underway for his tomb. As well as his monumental work Don Quixote, which he himself considered the first modern novel, his extensive literary production included poetry and theater. It also appears that his scientific culture must have been considerable, as he kept in touch with the advances that were made at the start of the 17th century following the invention of the telescope. It is even possible that he made a significant scientific contribution naming the satellites of the planet Jupiter, which were identified when Galileo Galilei, the astronomer from Pisa, pointed the new instrument to the sky. Simon Marius was born in 1570, or probably in 1573, near Nuremberg. He studied astronomy in Prague with the famous Tycho Brahe and Johannes Kepler. He became Brahe’s assistant for a few months, before his death in 1601. For three years until 1605 he studied medicine in Padua. It was in Padua that he may have come into contact with Galileo for the first time, as he lived there from 1592 to 1610, his annus mirabilis, where Galileo was teaching mechanics, geometry and astronomy. Galileo, on the other hand, understood on January 11 that the “stars” orbited around Jupiter (this was after Marius has suspected that fact, if the version in “Mundus Iovialis” is accepted). Two days later he observed the fourth satellite, before Marius did. In March, Sidereus Nuncius” was published in Venice. At the end of the year he Galileo discovered the phases of Venus, similar to the lunar ones, and notified Kepler of this by letter by means of a curious anagram, and also to Castelli and Clavio, to ensure his claims to priority, although he kept the information unpublished until years later. A re-analysis of the observations of the two men leads to the conclusion that Marius was probably honest in his data, although he perhaps did not understand the importance of his discovery in 1610. First, there is the fact that positions of the satellites published by Galileo are relative to the angular size of Jupiter, which he never published. The tables calculated by Marius included these data from Galileo. Given that the results (angular radius of the orbits and of the satellites) are better than those of Galileo, he had to have collected his own observations. Thus both Galileo and subsequent generations of astronomers and historians were unjust with the role he played in the discovery of the satellites. The irony of this story is that the moons of Jupiter are sufficiently bright to be seen with the naked eye, without the need for a telescope. Ganymede or Jupiter III (the Galilean name) is the biggest (bigger than the Moon or Mercury) and is notably bright, reaching a magnitude of 5 (in comparison, the weakest visible stars on a dark night have a magnitude of 6). This in principle means they can be identified without the aid of a telescope and they could have been discovered in antiquity. But it is Galileo Galilei who left us the first proof of their existence. The poem praises the virtues of Queen Margaret of Austria, the wife of Philip III. Cervantes’s scientific culture is evident not only because of the description of the planets and the Sun, assumed at that time by most intellectuals that they revolved around the Earth, according to the geocentric theory. 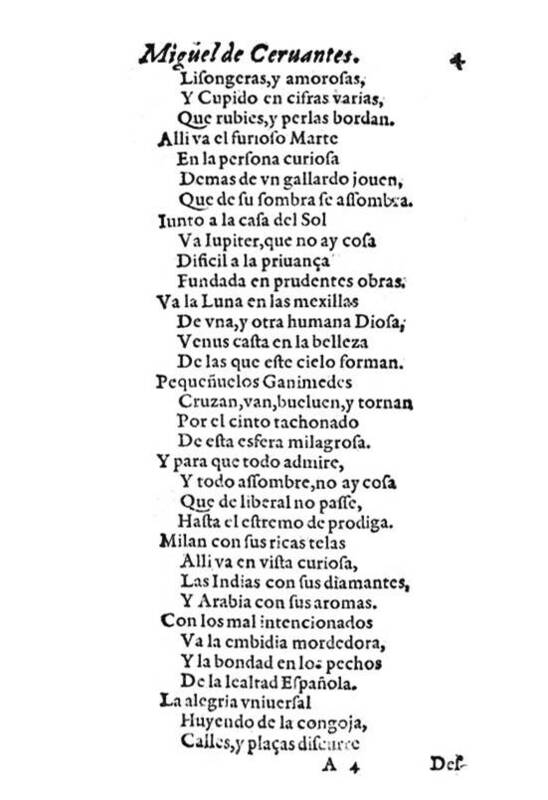 The most remarkable thing is that Cervantes refers to the Jupiter’s satellites shortly after they were discovered, given that the four final verses have an explicit meaning: the words “cruzan, van, vuelven y tornan” (“they cross, go, come back and do it again”) leaves little room for one’s imagination, and would refer to a relatively concise description of orbiting around Jupiter; while the last two verses, “por el cinto tachonado / de esta esfera milagrosa” (“by the gilded belt / of this miraculous sphere”) refers to the Ecliptic, the imaginary circle about which the planets move, and apparently the Sun, and the celestial sphere. Hence, it is written, from an astronomical perspective, and not only from a mythological one. Reproduced using the 1st edition of Novelas exemplares, In Madrid, by Juan de la Cuesta, 1613, f.1r-f.38r. Location: National Library of Spain. Sig. Cerv./ 2538. The dating of the text is relatively simple: it is was published in 1613, the dedication signed in July; the permission by the censure is dated July 2, 1612, and it is was approved seven days later. Kepler’s proposal to Marius about the names of the satellites was made considerably later, in October 1613, according to “Mundus Iovialis”, which appeared in 1614. Therefore, the name suggested by Cervantes clearly predates the suggestion made by the two German astronomers. Most importantly, it shows signs of Cervantes’s scientific culture and about the dissemination of Galileo’s important discoveries. The poem speaks of a special mass for a royal birth, though it does not specify which was the one in question. Queen Margaret of Austria bore eight children between 1601 and 1611, but the context of the poem appears to suggest that it refers to the last, Alfonso of Austria, who was born and died on September 22, 1611. It is generally assumed, however, that it refers to the birth of the future Philip IV, which occurred on 8 April 1605. If that was the case, then “La Gitanilla” had to have been written between that date and June 1613. From the poem, however, we can assume that it is later than 1610, given that the heroine, Preciosa, is abducted in 1595, and she is 15 years old when the story takes place, and it would be very unusual for Cervantes to have projected the story into the future. It is possible, however, that the romance predated or was subsequent to the novel itself, and that it was included in the text before it went to print. In any event, it is important to bear in mind that “Sidereus Nuncius” was published in March 1610. 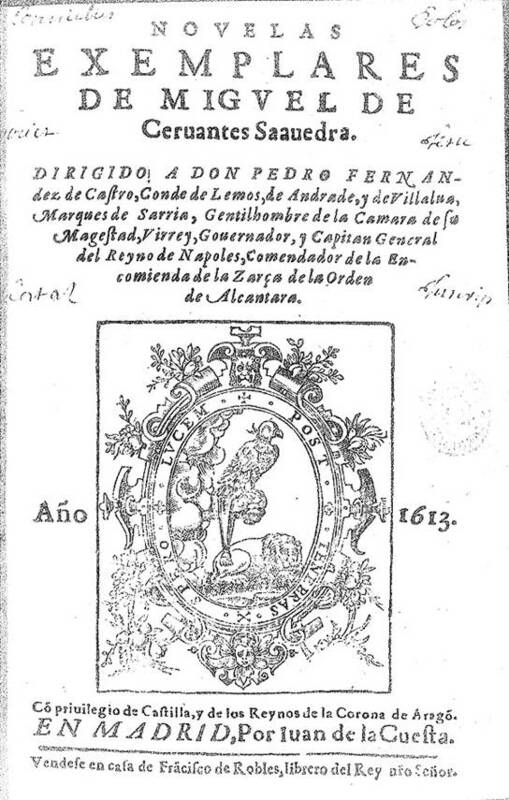 It is very unlikely that either Kepler or Marius had access to Cervantes’s “Novelas Ejemplares”. It is possible, though it would be very difficult to prove, that a reader who had enjoyed the work might have mentioned the name Cervantes gave, of little Ganymedes (which is generic name for the four satellites), to Kepler. But it is more plausible that the author of “Don Quixote” might imagine a very fitting name for the small cluster of followers around the largest planet in the Solar System, based on Greek mythology (a rule which has been kept intact until recent times) and that it was exactly the same name suggested by Kepler. Hence, Cervantes would not only the first person to write a novel – and an extraordinary one – in Spanish. Through his poetry, which was not always highly regarded, he would also have given a name to these four objects, satellites that have helped to construct the picture of the world as we know it today. Finally, it is worth considering that perhaps Cervantes was not the only early seventeenth century Spanish author who refers to aspects of this scientific revolution. It would be interesting to analyze how many astronomic references are can be found in the literature of the second part of the Spanish Golden Age or “Siglo de Oro”. If the number is significant, then it would mean that Spain, at that time, was not as isolated from the breakthroughs being made in human knowledge as one might think. It would certainly be an interesting area for research.